Have you resolved to inspire outdoor envy in your neighborhood this year? If you want to turn your yard into an outdoor oasis and a place that becomes a relaxing and entertaining paradise for your friends and family, nothing quite does the job like a custom water feature. In this blog, we’re going to explore a few elements of custom water features in order to help you begin conceptualizing the ideal water feature for your backyard. So keep reading and start imagining the possibilities! When designing a custom water feature for your backyard, you want to ask yourself what the primary purpose of the water feature will be. Many people want something to provide soothing sounds and images in a setting that inspires quiet reflection. If that is you, consider something with minimal lines and a lot of surface area, such as a pond or a pool with a simple fountain feeding into it. 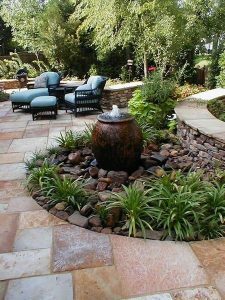 If the purpose of your custom water feature is to provide a pop of excitement and a place to gather and socialize, you’ll want to imagine a water feature with more going on visually. Fountains and waterfalls with multiple levels and featuring rocks and boulders of many sizes and colors are great ways to capture the attention of your family and guests. Where your water feature is located in the yard makes a huge impact on the kind of effect it will have on you and your family. A lot of this depends on size of the feature you want and how much room you have. It is also dictated by purpose, to a certain extent. If you want your water feature to be that focal point for your guests and family, somewhere near or on the patio and close to the back door makes sense. If it’s more of a place to escape to nature, somewhere away from the house and closer to the property line makes sense. 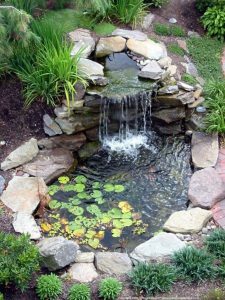 Variations of fountains, ponds, and waterfalls are often the most picturesque and popular options for custom water features but we have seen plenty of other ideas turn out great, as well. If you’re looking to really transform your yard into a natural paradise, a small creek could be a great idea. A small, standalone water wall can add an understated and modern touch. Whatever idea you choose, don’t forget to take it to the next level of beauty and functionality by adding landscape lighting. 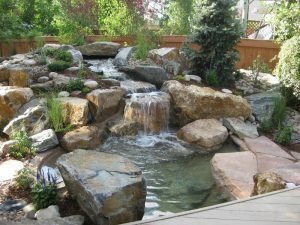 We hope this blog has inspired your creativity and that you have started imagining the perfect custom water feature for your backyard. If you would like to learn more about how to make your outdoor dreams a reality, contact us today! Let’s build something beautiful.